Osaka Castle (大阪城) is one of the major castles of Japan located in the center of Osaka City.It was built in 1585 by Toyotomi Hideyoshi and rebuilt by Tokugawa Hidetada. It is well known as the Castle of Toyotomi Hideyoshi. There are Tenshu (reconstructed), stone walls, moat and keeps, and many of them are still remains as the original. The entire castle is still preserved well so that you can see the actual castle from Sengoku period. Many of the ruins are chosen as the important cultural treasure of Japan. There are many attraction such as museum, and concert hole in the castle. Admission for Tenshu: 600 yen for adults, free under junior high. It is well known as the Castle of Taiko, Hideyoshi, but current structure, stone walls, moat, and keeps were actualy buit by Tokugawa Family. After the fall of Honganji Temple in 1580, Toyotomi Hideyoshi was built his castle on the land of Honganji Temple. It has three baileys and three layers of moat. When Otomo Yoshishige visited from Kyushu, he acclaimed this castle was the strongest castle of Japan. During the Toyotomi period, it was the center of their government. After Osaka Natsunojin in 1615, Siege of Osaka, Toyotomi Family was downfallen, and Osaka Castle was directly ruled by Tokugawa Shogun. 2nd Tokugawa Shogun, Hidetada, built new castle and it was completed in 1629. During the Edo period, it was ruled by the Tokugawa Government in Council until the Meiji Restoration. Current Tenshu was built in 1931. In the Edo period, there stood two Tamon-Yagura Turrents above Ote-guchi Entrance. While one of the turrets still exists today, the other independent turret on the south side was lost. This turret measured about 27m east-west and 6m south-north. Merchants were allowed to enter the Ote-guchi Entrance on a regular basis, where a market was held for hatamoto, direct retainers of the shogun, who were assigned to one-year service at Osaka Castle by turns, to purchase daily commodities. Fore this reason, the turret was called Ichi-tamon. "Ichi" means market. This turret was lost to fire during the Meiji Restoration and only its foundation stone remains Today. Built atop the box shaped stone walls of Otemon, this turret encompasses Daimon, the entrance to the Second Citadel, and defends the main gate. This is the largest remaining turret of this type in Japan. Built in 1628, it was destroyed by lightning in 1783, and reconstructed in 1848. Encircling Hommaru, Inner Bailey, the inner moat is filled with water from the east to the north but from the south to the west, there is no water. 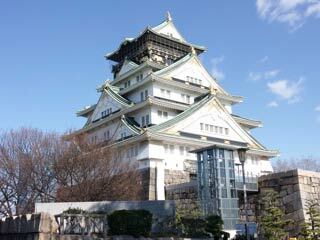 In the original Osaka Castle built by Hidehoshi, the southern part of the inner moat was dry. It has been also dry since the castle was reconstructed in 1624 during the Tokugawa Government. The reason for this remains unknown. Magnificent stone walls were built here to defend the front gate of the central citadel. Scorch on the stone walls indicates the site of Sakuramon Daimon Gate which, was burnt down in the civil war in 1868. The stone in the facade, called "Takoisi" or "Octopus Stone," is the largest stone in the castle. The surface area of the stone is about 60m2 and its estimated weight is 130t. The western part of the foundation of the Main Tower, Tenshu, was divided between the southern and northern sections by stone walls, and the gates that provided access between these sections were called "Shikiri-mon." To prevent enemies from going straight to the central part of the Hommaru, Inner Bailey, from the north, the stone walls on both sides were built in stagered positions, and the Tenshushita-shikiri mon Gate faced eastward. This gate was built by the Tokugawa Shogun as part of the reconstruction of Osaka Castle, and is thought to have been lost to fire together with the fences built on the stone walls during the Meiji Restoration. Built in 1620, this gate was critical in guarding the northeast of the castle in emergency. Originally made of wood, Gokurakubashi (Paradise Bridge) links Yamazatomura and Ninomaru. Built in 1626, it was burnt down in 1868 during the Meiji Restoration and left in that condition for a number of years, and it was rebuilt as a ferro-concrete bridge in 1965.